Post your entries for the Trip Report Competition here! NUCC, 6'3" "Just big boned"
Now gather round the fire children and let me tell you a story: It was the first shiny weekend of February 2019, my 3rd weekend away and 1st trip to Wales, and the stunningly beautiful, and well appointed SWCC. We had snow, a very reasonable amount of it and I was very comforted in knowing it would be blissfully warmer underground. It seems the warmth of OFD was somewhat legendary. This would come back to bite me in the arse incredibly hard later……. On the Saturday morning, only slightly hungover and after a brilliant NUCC classic breakfast of full English I found that as usual I somehow dodged the freshers trip and would be spending the day on a through trip from OFD1 through to Cwm Dwr jointly with one member of OUCC . 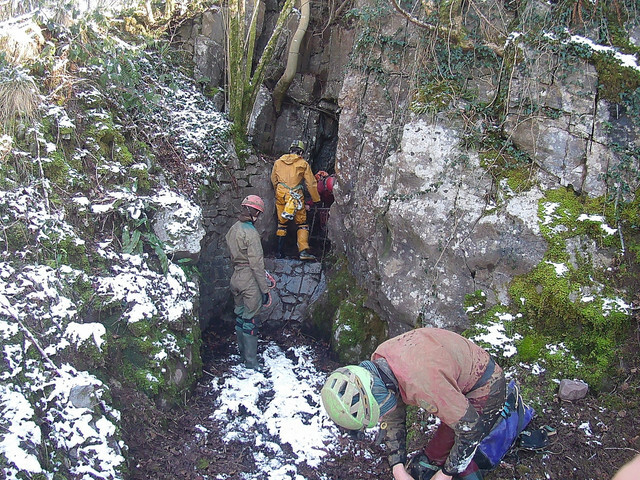 After casting my eye over the quite insane wall sized cave survey in SWCC I quickly realised why Ogof Ffynnon Dhu had been shortened to OFD. So Rosa, Louise, Alex, Ryan and I packed our lives up only interrupted by a few snow ball fights and got stomping out through the amazing white. The walk down to the entrance was slightly interrupted by Alex deciding he desperately needed to climb a cliff to inspect an opening which apparently turned into a reasonable drop though one with bolts, a target for a latter exploration! We arrived at the entrance and in short order climbed down the ladders while I feared greatly for my fingers after seeing the big heavy gently propped hatch I had to put my fingers under. I immediately noticed the cosy temperature which was glorious after the snow above. From this point the group made a cracking pace along the streamway, over the scaffolding bars of the pots. I found this bit of streamway utterly stunning, likely my favourite bit of cave I’ve done. We quickly made our way to the Boulder Chamber and here we hit our first snag. Our intention was to find The Connection into OFD1 ½ and the team scrambled about the bolder choke and settled on an entrance directly onwards, in the middle of the choke near the top. This led into a feet first squeeze that got gradually tighter into a quite horrendous squeeze which was conquered valiantly though with a lot of difficulty by the first three of the party of five. I however, being 6’ 3”, of broad shoulder and chest and…. well all round, did not. After 10 minutes of chest compression and wriggling I finally gave up and explored the upper muddy passages over the boulder choke trying to find a bypass, then almost dropped a boulder from an unstable pile onto a head that was following me. Oops, freshers lessons to be learned. This could have been the end of my foray except the team realised this wasn’t the entrance to the connection anyway…. After extricating themselves back into the Boulder Chamber another scramble around and we found a more friendly route to the lower right, having lost an hour in total. We proceeded straight of towards the fabled letterbox, a slot high up in a sizeable chamber on a steep face with a chain above it. Thankfully I fit with no issues at all making a smooth slide off the overhanging chain feeling very ninja and going straight into an EXCELLENT bit of bum sliding and crawl to the 12m Divers Pitch. We used a life line for the climb down which was pretty slow to set up, eating almost another hour part of which I was stuck sitting in a waterfall, oh the joy. Divers Pitch turned out to be a pleasure to climb down with bountiful hand and foot holds like the easiest of routes on a climbing wall. Quick progress down some big sandy stomping tunnels latter and we hit The Smithy and promptly got lost. For a very long time. After a lot more stomping we settled into eliminating all possible routes which means I have now seen a lot of the lovely mid level passages and chambers but am also not entirely sure which was the correct one in the end…. 1-2 hours of taking every possible route was just getting a bit tiresome when we got the way out into the Cwn Dwr Choke which was a really grand bit of squeeze and twist, I think the big tunnels of the Smithy had given me agoraphobia. This quickly led onto the final Dim Dwr crawl, the longest I’ve done at which point I was getting pretty shattered and got JUST a bit tight flat out squeezing over loose rocks but then suddenly I was free! Past a helpful sign telling me to use caution in this “category 2 confined space”.... Into the bottom of the Cwm Dwr entrance. And it’s here our glorious leader bless his cotton socks thought to mention I might have some issues getting out the exit….. Up some rotten logs less than 6m below the surface the exit turns into two sections of concrete, smooth drain pipe with single hand / foot holds up one side. Due to laws of angles it was too tight for me to get a leg up to the next ledge, or reach to the hand hold above so, half way up, 3m from the surface I could get no further even with some loving advice from my team members. Now here is where the snow above ground came into play, where below ground it was a lovely 12-14 C, here it was below freezing and I was stuck hopping one leg to another wedged in a tube, rapidly losing feeling in my hands, then limbs for what felt like forever and was probably a pretty long time. Although my spirits stayed high, thankfully help was quickly retrieved from the SWCC and a large portion of the rest of NUCC came to rescue me / laugh. 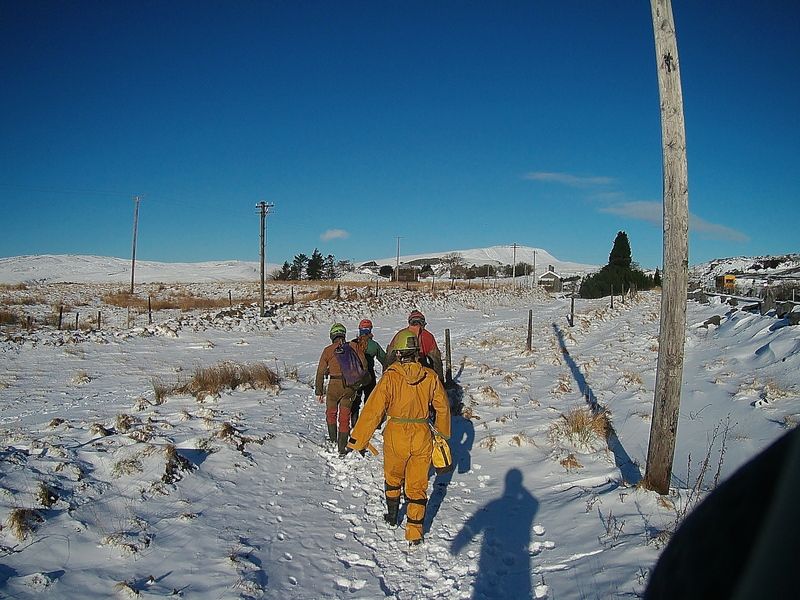 Although easier solutions were likely possible Jacob got to use his brand new rescue gear and a team effort hauled me up enough to grab the last few hand holds and collapse into the dark snowy stunningly beautiful star cast hills of Wales. Poor Louise who was stuck behind me got to exit then a quick huge hug, team photo and we hightailed back to the hut where I started to realise quite how cold I was. I took a good 4 hours in the hut before I was back to normal and felt warm again. But thankfully I was happily never in any real danger. A range of rope set ups or SRT kit would have got me out. 1. An SRT kit, or at least a belt and rope are always indispensable. 2. Don’t sit in a hole getting hypothermia if you’re just waiting, back up and move around you pillock. 4. Be a good victim and let your friends use their shiny new rescue kit, it makes them happy. I want to go back and conquer Cwm Dwr properly unaided one day, I’m fully aware that being tall is no excuse and bigger people than me can manage it with some wedging. Though I must confess while stuck in that god forsaken tube I did fantasise about all the things I could do with a jackhammer or some Iron rungs….. Overall a stunning trip. Had all the great features: lost, stuck, pretties, songs and squeezes. NUCC Love. 1 Like Maddoghouse likes this. "Our team of six (Maddie, Andy, Shivan, Lucy, Nicole, Jacob) introduce the freshers to their first cave by throwing them down an 8m hole. With this challenge overcome the trip proceeded with a mixture of physical tests, such as clambering and squeezing, and mental endurance conditioning, provided by a near endless Lord of the Rings quotes. The cave had earned its name; mud was a frequent companion to our journey. Our opinions were split, broken, and reforged as to whether this was a good thing or not. Nonetheless Maddie and Andy insisted that despite its name Sludge Pit Hole was not really muddy. There were some impress moments of respite. A steam which lead to an active dig that is trying to connect Sludge Pit Hole to Swildons was really pretty. We want to congratulate Maddie for her first lead of a caving trip, it was an incredibly fun and thorough experience. 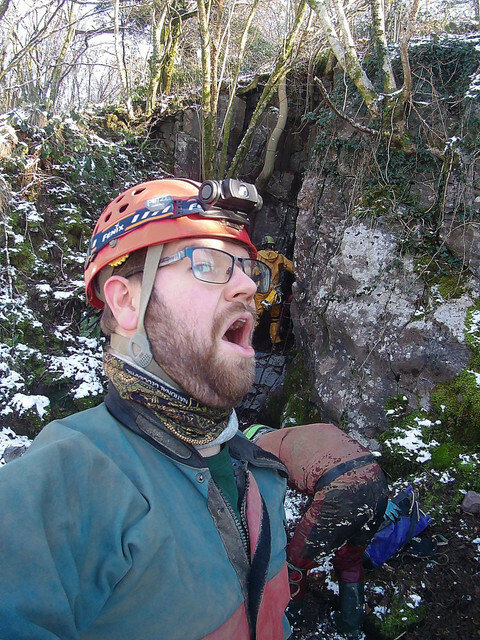 The "very very" novice cavers are now only "very" novice. Everyone is impatient to go caving again." 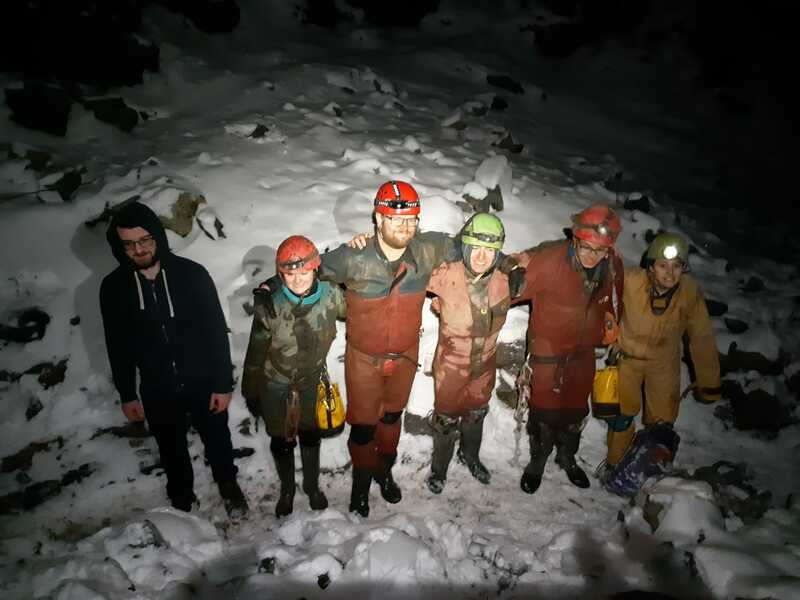 "First caving trip - Dark, cold, wet, muddy, tiring, miserable, and overall a great time. I may have smashed my phone and screwed my clothes but my accomplices were angels. Maddie and Andy are perfect leaders, Lucy is the best fresher, Jacob is a motivated speaker, and Nicole is a bully who throws mud." Also being a long knee'd caver the exit of Cwm Dwr is a pain. The best technique I've found is to turn 180 around and stick your arse into the wider bit of tube. I can then just about get my knees up to get a heel inot the holds under my bum. This is less tiresome than the alternatives of doing pullups for the length of the tube as you discovered. AT least you can wedge in and take a breather as needed.